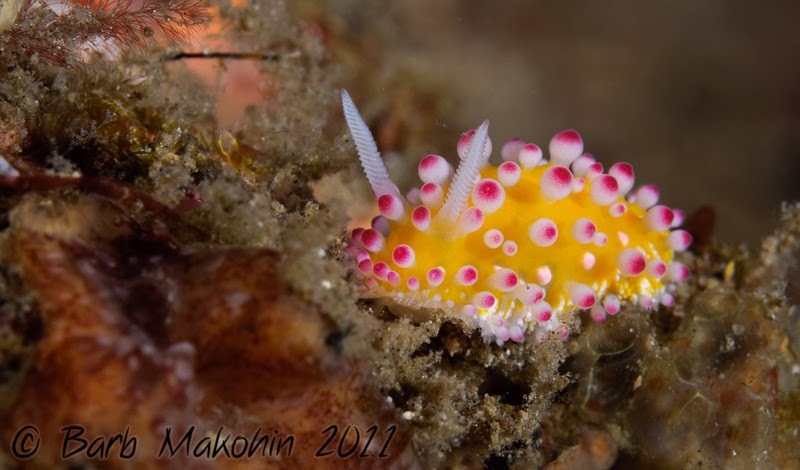 Chromodoris willani, photographed by Samantha Craven. 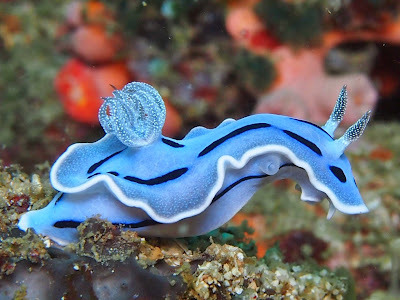 The name 'sea slug' does not sound immediately enticing to those not in the know, but in fact they include some of the world's most fabulous animals. 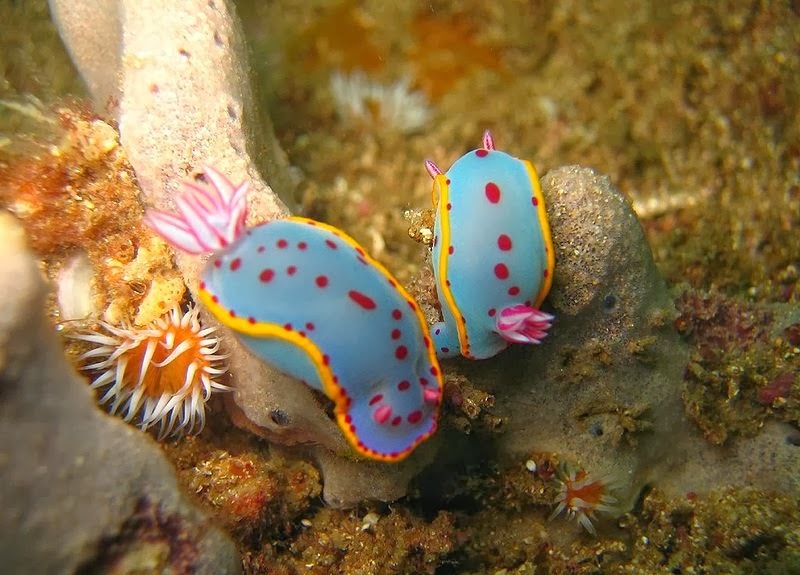 The Chromodorididae are a family of more than 300 species of ludicrously colourful sea slugs, with the greater number of species found in the Indo-West Pacific region. They are specialist feeders on sponges, preferring those sponges that do not contain mineralised spicules. Cadlinella ornatissima, photographed by Barb Makohin. Their bright colours, of course, are a signal to any would-be predators that they are highly toxic and distasteful, in the manner of monarch butterflies, poison-arrow frogs, or raspberry cordial. As noted by sea-slug researcher Bill Rudman in this forum post, toxic compounds are often concentrated in the mantle fringe that runs around the sides of the chromodorids. 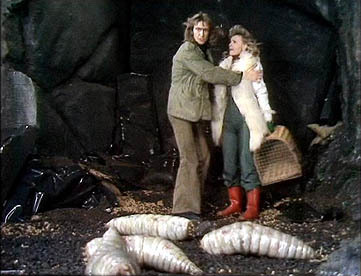 They will often flap this mantle, and Rudman speculates that this may make an attacker more likely to bite off a piece of the distasteful (and easily regrown) mantle rather than the main body of the animal. Pair of Hypselodoris bennetti, photographed by Richard Ling. 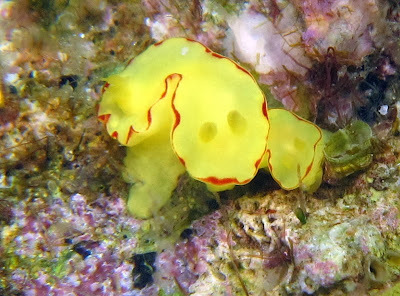 Until the classification of the Indo-West Pacific species was reviewed by Rudman (1984), most chromodorid species were lumped into a single genus Chromodoris under the belief that there were few relaible characters available to distinguish higher taxa within the family. Rudman (1984) identified a number of features, including characters of the reproductive and digestive tracts, that could be used to separate genera. A molecular analysis of the family by Johnson & Gosliner (2012) led them to recognise 17 genera of chromodorids, with genera recognised by Rudman (1984) as pan-tropical proving to be polyphyletic. Doriprismatica kulonba (previously Digidentis kulonba), photographed by Bill Rudman). 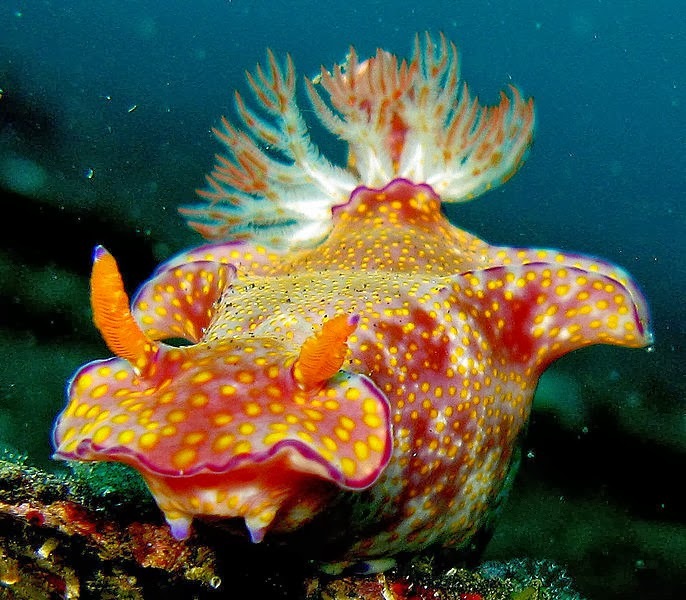 Though sea slugs are mostly thought of as tropical animals, there are some that make there homes in cooler waters. Doriprismatica kulonba, for instance, is found around south-east Australia. Ceratosoma tenue, photographed by Steve Childs. Long-term readers may have noticed that this post contains a somewhat lower text-to-imagery ratio than usual. For this, I make no apology. Diversidoris flava (previously Noumea flava), photographed by Chad Ordelheide. Johnson, R. F., & T. M. Gosliner. 2012. 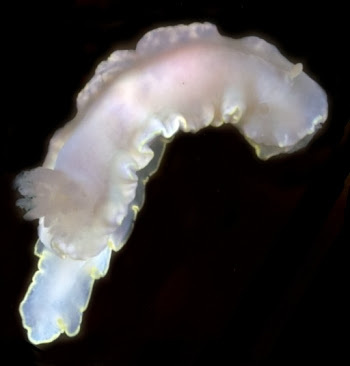 Traditional taxonomic groupings mask evolutionary history: a molecular phylogeny and new classification of the chromodorid nudibranchs. PLoS ONE 7 (4): e33479. doi:10.1371/journal.pone.0033479. 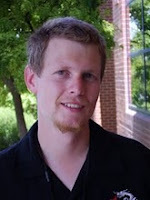 Rudman, W. B. 1984. The Chromodorididae (Opisthobranchia: Mollusca) of the Indo-West Pacific: a review of the genera. Zoological Journal of the Linnean Society 81 (2-3): 115-273. I approve of the image-heaviness! Ah, good, so the issue you had with commenting has gone away? It seems so - something with a bad cookie. Hi, Christopher. People whose appetite you've whetted might like to look at a copy of Cobb, G and Willan, R.C. 2006. Undersea jewels: a colour guide to nudibranchs. Canberra: Australian Biological Resources Study; ISBN 0 642 56847 2. And for Australian addicts, nudibranch.com.au! wow -- I can see why you went with image-heavy!